When you're living in your college residence hall, if you don't share a community bathroom with the rest of your dorm floor, then you're going to have your own dorm bathroom in your suite-style dorm room. That means you're lucky to have a dorm bathroom that you're only sharing with a couple roommates! However, it also means you're going to have to think about even more dorm essentials to add to your college dorm checklist. If you have your own dorm bathroom, you have to think about college supplies like dorm shower curtains, dorm rugs for your bathroom, and other dorm necessities. You already know you need a dorm shower caddy to keep all of your dorm bathroom accessories organized, but have you thought about the fact that your dorm roommates also need dorm room storage for their dorm shower caddies? That can result in a lot of college shower caddies taking up a lot of dorm room space you could use for other dorm essentials. Don't have a bunch of dorm shower caddies taking up your precious dorm room storage space! Add our Mesh Storage Hanging Shower Caddy in Black! 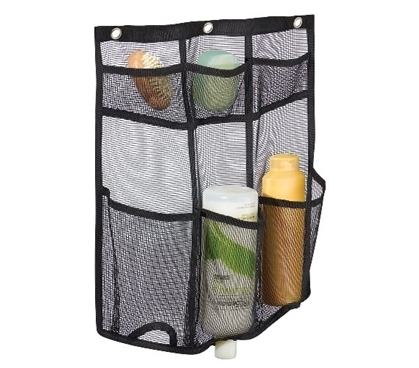 Our Mesh Storage Hanging Shower Caddy has 6 mesh pockets to hold you and your roommate's dorm bathroom accessories all in one compact dorm shower caddy. There are three large and three small pockets for your dorm essentials and the bottom pockets even have openings for the tops of your shampoo and conditioner bottles so you don't have to take them out every time you use it. 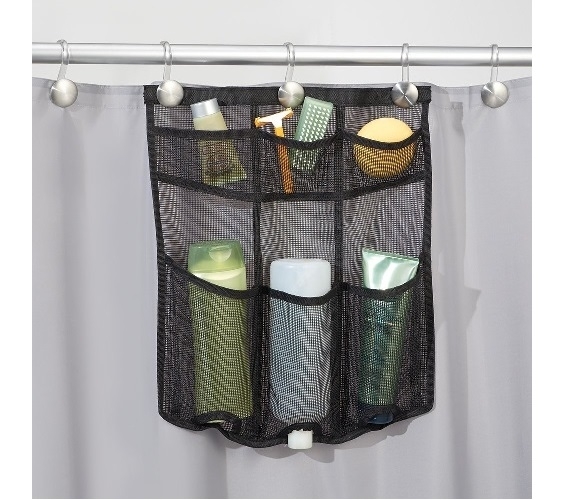 What's even better about this durable, waterproof Mesh Storage Hanging Shower Caddy? It hangs right from your dorm shower curtain hooks! that means you don't have to worry about bottles tipping over onto your feet and cluttering your dorm shower!